I’d like to expend my deepest sympathy to those victims of the massive destruction by typhoon Haiyan in Philippines. I watched the typhoon missed us to the south and moved on to Philippines as it developed. It could have been us. I wish all the supports from over the world will reach to those in real need without further delay. The water temperature is finally dropping and the amberjack is moving toward the shores. There isn’t a news of anyone catching a big one on the island yet. But I hear local jiggers are starting to catch 2 – 3kg sizes. YES! Amberjack season is starting! I haven’t been able to go out for a while and I was excited to go on this picnic with Murubushi boat. The first catch of the day was Cranky! A 3kg Amberjack. I started out with a 210g Rector with 603-6 as usual. I didn’t get any contacts for the first couples of rounds, but other anglers with hi-speed jigging caught some amberjacks. I gave up Rector and switched to 230g Cranky. Slow lift and fast fall approach. I got the contact at the end of the fall on count 12, probably 8m above the bottom. 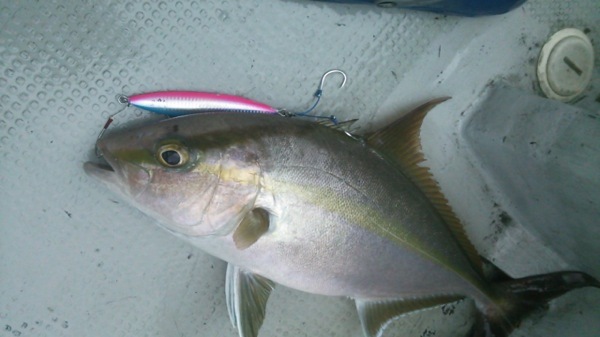 Then I switched to Gawky 220g with 603-3 and caught an Island Trevally. 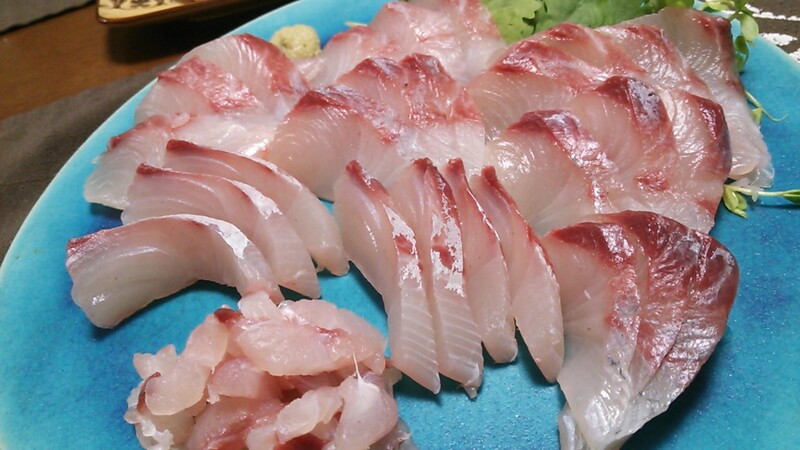 This fish is really good sashimi. Always nice to bring one home. Got a video footage on this. I switched back to Rector several times, but my mighty Rector was just not working this day. Well, it happens. But the man on fire was Cranky! Great for sashimi or sauted. Then the tide started moving again in the afternoon. The sounder shows the baits floating 20m to 30m above the bottom. The current is picking up and the fish are active. I switched to Spunky. Spunky works well in this kind of situation. Fast to drop into the point and performs well on uplifts. I wanted to search a wide range from 0m to 30m and I can do it quickly with Spunky. 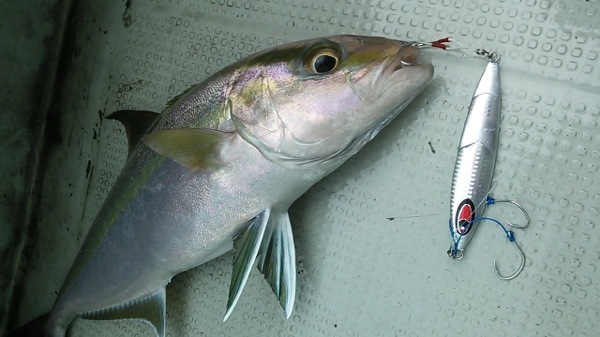 I found another Amberjack as showed in the video footage. Small fish attacks the baits first. Small juveniles are curious and quick. They make bites on quick moving jigs. As the bait ball concentrates and becomes dense, big ones join. They are not as quick as juvelies, so they make bites on easy targets. Slow hesitating or crippled baits. So when you make quick slow pitch with light Spunky or Rector, you are likely to get a lot of contacts but from small fish. When you make slow falling movements with heavy Gawky, Rector or Cranky, you are likely to get less contacts but from big ones. Of course, High Pitch works the same. As I figured I got enough fish to bring home, I tried some High Pitch with 400g Messiah with High Pitch Jeker 501. High Pitch takes up a lot of energy but I figured this is the time to give it a shot for a big one. But no luck for me this time. 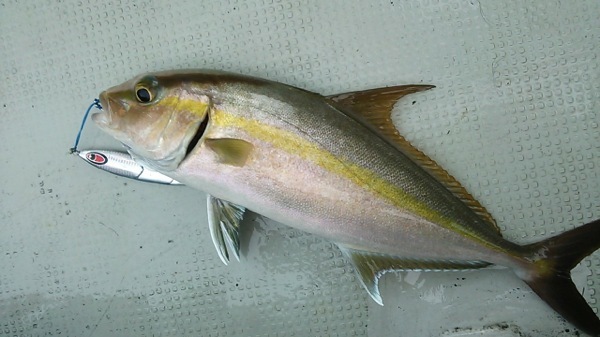 Other anglers were catching small amberjacks. But the situation was ideal to go for a big one and I was determined to keep swinging that hard stick. But that was all she wrote for the day. Well, I got enough fish for my families and neighbors. I’ve done all the tactics that I wanted to play. I’ve given my shots. I enjoyed my day out. 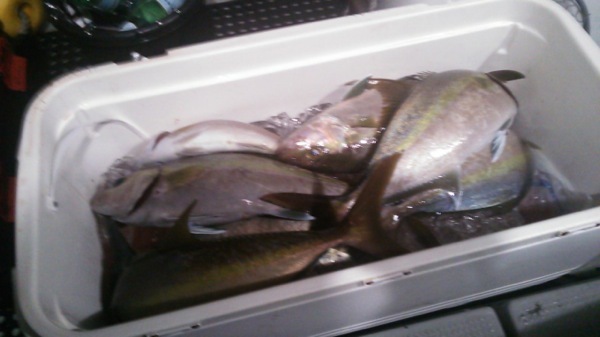 Nice catches bro, it’s so nice for you to have a season where the amberjacks would come close to the islands. Been meaning to ask you this actually, what’s your drag setting for slow pitch jigging? Thank you for your comment. I set my drag pretty roughly. I try to remember how 5kg feels with my hand. With PE2.0 I set it just about that. With PE1.5, I set it a little less. Mr. Hirota of Seafloor Control showed me how to use thumbing. He always sets his drag pretty tight, probably a little more than 5kg. When the fish runs out the drag, he lets it run for a moment, and then use his thumb to stop and make it turn its head around. Like walking the fish in a circle. Nice one Totos, I found these videos really helpful in understanding the variations you talk about. My last couple of trips have been in deep water and there is very little I can do in variations in those conditions. Unfortunately its not great weather here for us this time of year, so I might be waiting a little longer… but this has me itching to get out! Thanks Ben. I’m happy to hear the video is being helpful. Thank you for your encouragement. OK, variations for deep water. I think I know what you are asking. When you are under conditions where you get too much water on the line, the tactics will be limited. I keep that in mind and show what I know when I have a chance. Did the high pitch video help you? Btw Totos … I noticed u pinch yr line when ur jigging in the video ? I’m not sure what you mean. Do I pinch my line? Maybe when I reel in a small fish, I guide my line into the reel to level it out. Maybe that’s what you spotted? I don’t touch my line when I’m luring for fish. I really enjoyed those videos especially the high pitch throw – thank you. Slow pitch has been very hard work here for demersals since late September. I’m really looking forward to summer. 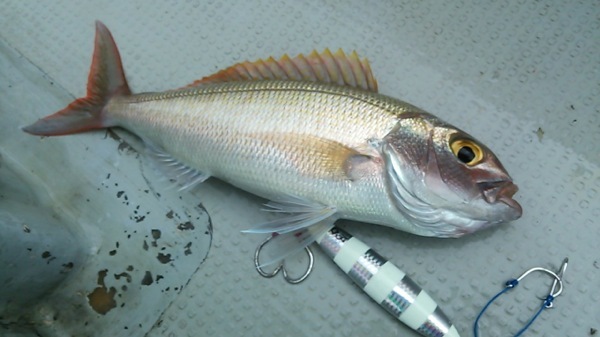 So you have a tough season for jigging in the winter in Australia huh? I wonder what you mean by “hard work”. Too strong wind or current to stay vertical? Fishing in deep water? Sorry for the late reply. Yes I mentioned hard work because of tough currents. In springtime we can have very mixed up winds. If winds come in from North for a few days at a time, sometimes this creates a very cold layer down deep. Even though the water up top is warm and the normal current moves North to South, near the bottom the current might be travelling South to North and the jig feels like ice. In these conditions it is nearly impossible to stay vertical. Seas can also be difficult for the boat because of left over surface swell from previous wind that is now mixed with a new swell. As you say in other posts, if you cannot stay vertical, slow pitch is tough. In these conditions my heaviest Inchiku gives extra seconds in the strike zone but even that is super tough because the very cold water seems to turn the fish off. I see what you mean. So it’s the double layer situation and the cold bottom current that gives you hard work and few fish. It does sound like a tough situation. The double layer is tough even with a spankered boat. It feels like you are pulling up a rubber band and the jig is not moving. It seems impossible, but Mr. Hirota showed me a few tricks the other day. He had 603-6, and switched down to PE1.2 with Rector 300g on. 110m deep, very choppy surface. He slowly lifts with the wave, but the water pulls back down and the rod tip does not spring back. He doesn’t care. He released it down at the top of the wave for the fall. And he hit a 5kg cod. He said spring-back action is just one way to get the jig on its side. But when it’s hard, release the uplift in a way the jig falls and slides on its side. That is the other way to get the jig on its side. And he emphasized that you need to make change of pace somehow. It’s hard to explain in a text. But I was so surprised, I’ve never thought about it. Hope this gives you an idea or a new perception for the tough conditions.